Hi all! I just wanted to do a quick check in and update you on progress seeing as it’s been well over a month since the last time I did this. Everything has been progressing at a steady pace all be it a little slower than normal due to working on several freelance projects. A portion of what I have been up to is a few improvements that were much needed in the game. Spine files are now loaded in a different way meaning that the game’s loading times have been drastically reduced, the loading previously was taking far too long and was getting in the way of healthy development. I’ve also adapted the way in which Spine files are drawn amongst the rest of the world tiles which makes the system much more robust and easier to adapt in the future. I’ve had an overhaul of the path finding system since creating a path finding algorithm for the movement grids. This has now fixed a whole bunch of issues that existed with the previous system where by the characters sometimes didn’t stop and would also cut corners. The only thing left to do now is have them walk as close to an obstructed position as possible rather than flat out refuse to as they currently do. The main area I have been working on since the last update is the combat mechanics of the game and getting the basics down and working. Enemies now have a turn themselves and can walk to a random area within a certain range, this will later be altered to a proper A.I. system but for now I simply just wanted to give an illusion of them doing something. I’ve also implemented the shooting action for the player now along with a new version of the combat grid for aiming so that the player can shoot at nearby enemies and a health bar system for you to see both yours and the enemies health. Once hit the enemies health goes down until they eventually die then once all the enemies are dead the combat will end. There are a lot of different things to tackle next so today I’m having a planning day to see where I should be headed. I’ll also try and get a video diary up soon of the progress. Hi Folks! I’m back again, this time with a bit more detail on progress. Since the last update freelance work has kept me nice and busy so progress on the new project hasn’t been as much as I would have liked but it’s certainly starting to shape up. Here’s the latest development diary for the project and following it is a text break down of what I’ve been up to. I’ve now altered the enemies to be loaded from the map XML and only be visible and active when you are in the same room as them. At the moment there is only one enemy type but in the future enemies will be randomly picked based on how far through you are and what type of room it is. The enemies now detect based on distance all-though I have ramped this distance up really high so combat triggers as soon as you walk into a room with enemies contained. The main portion of the game I’ve been tackling since the last update is the combat which has been pretty exciting to finally work on. When you walk into a room containing enemies this instantly triggers, I’m not sure if this will be a permanent fixture just yet but my thinking is that it would make quite a good stealth mode. When the combat triggers it plays a small intro where it pans the camera to each enemy who reacts with an animation then finally back to the player where it fades the world to darkness and shows the combat grid and combat UI. So far the only actions implemented are moving and over-watch. You can select the action you want from the UI then select the square you want to move to on the grid and hit go to perform it. The nice thing about the movement gird is that it path finds each cell when obstacles are present so that it knows how many steps it takes to move around that object and any cells not accessible in the movement range will be disabled. 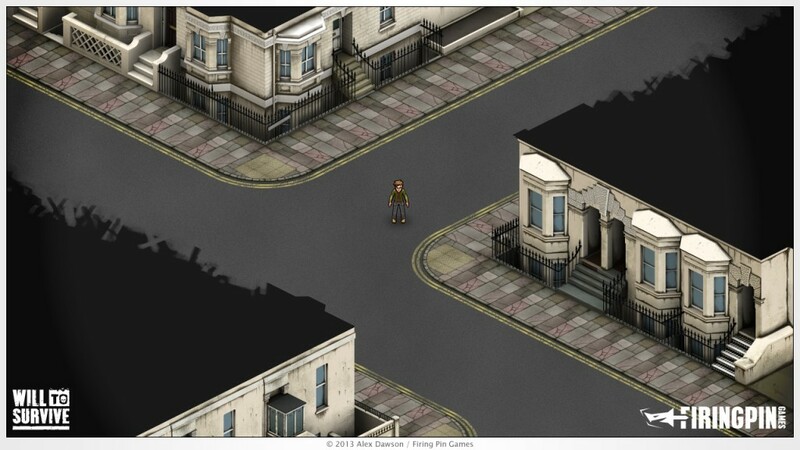 This is similar to the grid you can turn on in the PC version of X-Com. In the video I uploaded this doesn’t take into account corners but since recording the diary I’ve actually fixed that. It’s not a full combat system yet but the plan is to get through it piece by piece and adapt it based on how it feels to play. And to top it off here’s some concept art for the game’s main character. 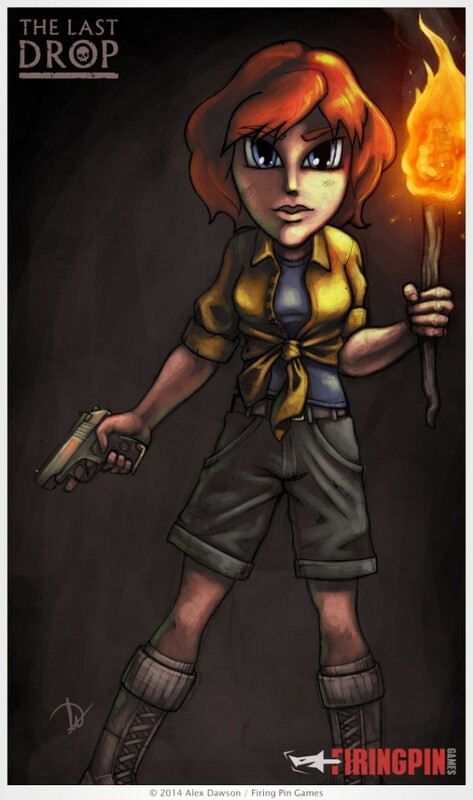 The concept for the main character of The Last Drop. Hi everyone, as promised here is the new development diary showing the new game in action so far. You’ll hopefully see how closely linked they are so as we develop the new project the work done will also go into making Will to Survive. Once the new project is finished we’ll be able to turn our attention back to Will to Survive and we will have a really solid foundation on which to build. Doing this also enables us to focus on only a couple of the main mechanics, combat and exploration. It means we can really devote time to polishing them and making them super fun and we’ll be able to get super important user feedback on those systems meaning when we get back to Will to Survive we can be safe in the knowledge that these systems work really well and give us time to concentrate on the other mechanics such as defences, simulation of attacks and cross platform save syncing. Hello everyone, it’s been a rather busy couple of weeks since the last update. This update is a rather important update and brings with it a spot of super fun exciting good news and a small bit of not so great news. I’ll go into everything in far more detail below but the quick and painless version is as such… we are currently postponing development on Will to Survive in order to craft a smaller project based along similar lines, the codename for which is Project Tunguska. As mentioned above we have decided to postpone development temporarily, it’s really important to note that this is temporary and I can’t stress this enough. The game is certainly not cancelled but we won’t be releasing it any time this year unfortunately. I know some of you will be upset by this and you have my sincere apologies, it wasn’t a a quick and easy decision to make. Will to Survive has always been a rather ambitious project so the reason why is fairly simple… size and funding. We realised early on after the failed Kickstarter attempt that without any form of funding finishing the project off was going to be quite difficult. Our initial goal was to carry on developing and eventually make a new Kickstarter attempt later on once knowledge of the game had increased. However as the project grew and adapted to certain changes we realised as time went on that even launching a Kickstarter for a small amount to fund an early-access build would probably still not give us enough funds to develop the game properly, we would need more cash in order to secure a bigger team. For a while now I had been trying to think of a smaller game that we could tackle to release quickly and help fund development but not detract too much from the main project. Up until recently most ideas were too different to Will to Survive, then one day my house mate suggested something that sounded fantastic and we set about working out how we could develop it but still make everything so that it can go towards helping the Will to Survive project as well. Our main goal in all of this is to develop the new project in such a way that a lot of it will go into further development of Will to Survive, so in essence although development is postponed the project will continue to develop by proxy. I hope you understand our reasons for doing this and aren’t too disappointed. Our thinking is that delaying releasing a game is better than never releasing it at all. So, what is the new project? Project Tunguska as it’s currently code named until we finalise it’s real name is a project based along the same lines as Will to Survive. It’s a randomly generated adventure survival game with roguelike elements. Think the Binding of Isaac meets Uncharted. I won’t divulge too much information just yet but I can say that it will feature the same exploration, interaction and combat mechanics used in Will to Survive as well as some of the survival elements. The great thing about these shared mechanics is that by focusing on a few core mechanics exclusively we will end up with highly polished versions that can later be used in Will to Survive so developing this new project will greatly help improve that in the long run. We are looking into the prospect of launching a Kickstarter for this game in May/June and releasing an early-access build no later than November. A preview of Project Tunguska in action. On Friday all being well I’ll be putting up a new development diary video showing the progress we have made on the engine as well as what we have done on the new project. We’ll be releasing more information about the new project in the coming weeks along with a new IndieDB page for it and possibly a Greenlight page once we have a solid build to show. Thanks for reading and hopefully you understand why we are shifting our focus and are excited by the new project. Feel free to ask any questions and I’ll do my best to answer them. Howdy all, it’s been a good few weeks since I last updated so I figured you were all due some progress info, how time flies eh! Progress is marching on at a nice and steady pace, we could probably do another dev video with what we have done but we’re thinking of waiting until we have the enemy AI stuff working before we do that. 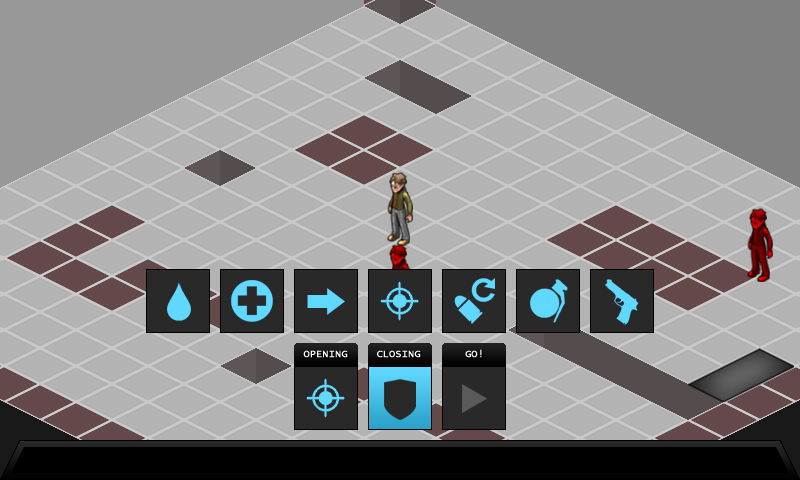 Interfaces are now fully ported, improved and are hooked up to drive the game through events. I’ve recreated the portal code which allows you to move between maps based on the other improvements done already and also added Spine artwork which makes portal creation more straight forward. The portals now also use Spine based hit box detection to make them more accurate to interact with. They also now use the same interact prompt as objects so when this gets more advanced you’ll be able to choose actions such as picking the lock or kicking a door down. A sneak peak at the new in game combat interface. And finally Dan has been busy working on the enemy AI, he has them patrolling about and is currently working on player detection and vision cones. They sometimes have a tendency to not stop walking however, so when the code is a bit more stable and they are behaving themselves we’ll look at getting a dev diary up to show you it in action. Hopefully soon we can start looking at some combat! I figured I would make a quick weekly progress update seeing as it seems like I managed to get a massive amount done since last Thursdays post. I’m not going to make a video as they take a bit of time to make but it’s safe to say you’ll be seeing all these improvements in the next development diary. This week I’ve mainly been tackling a re-write of the user interface library to convert it into a much more efficient event driven system. This has been on the cards for a while as the old system was a little cumbersome and I’ve learnt a lot since I first wrote it. Also, seeing as we are moving from a prototype build to actual alpha/release code it seemed pretty important to start off on a good footing before we begin to tackle combat and other improvements. In updating this system I’ve also created a new object interaction interface to replace the pink rectangle that could be seen in dev diary #1. This allows you to accept or cancel an interaction as you walk to it and will support future expansion for when we give you other options. Later down the line objects/items will allow you to perform certain actions without the need to go into your inventory screen such as picking up, examining, using, eating or equipping. 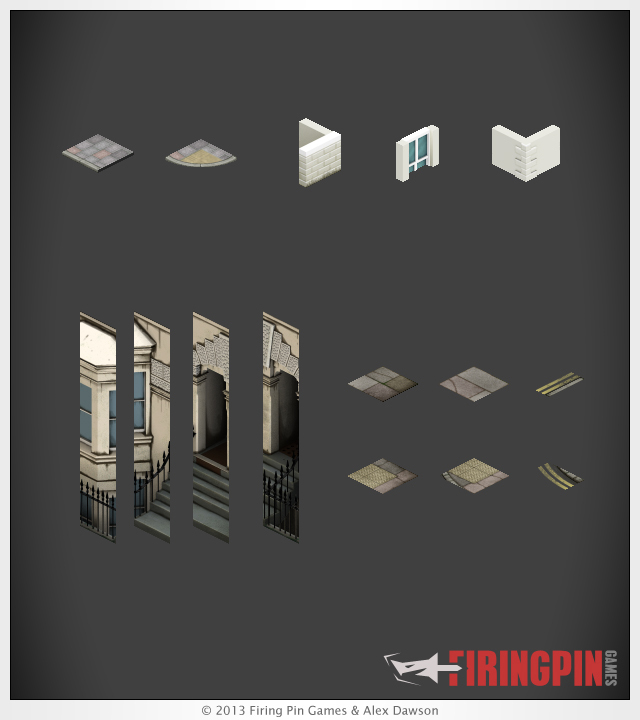 I’ve also been re-structuring the objects and items of the game. These were written very early on and so were in dire need of improvement. It was a pretty quick task and most importantly has allowed me to change the way I create art for objects to be more efficient. Objects are now using a Spine file for their art, this allows me to position them in the tile map editor much more easily and also create a polygonal hit box for them individually so that interactions with them has pixel perfect precision. It also means I can animate them using Spine and do some other interesting things later on… exciting! After I changed the way objects worked I realised using Spine for the detail and list artwork in the inventory screens and such would work really well and speed up the art creation process. So all UI screens now use shared Spine files for rendering item artwork. Dan’s going to be continuing his work on the enemy AI and patrolling this next week. All being well I should have the last few elements of the interface porting done this weekend so that next week I can create some more artwork for Will’s combat animations. It’s been a long time coming but we finally have a new development diary video for you to watch, everything has started to come together this past two weeks so we finally have something worthy of being shown. I’ll get into detail about what we have been up to after the video for those who want to read the wall of text that follows. So this has been a royal pain in Dan’s side over the past few months, after several re-writes on his side of things and a few changes on my side with tile map code and the like he has finally got the system working and in-game. Hurrah! It works really well so far minus a few small issues that Dan is sure to fix later down the line and it really helps when navigating around by mouse/touch input as you can see in the video. For those who don’t want to play using mouse/touch there will also be a keyboard/game pad input system available too. This system will also be used for AI patrol logic and the combat screen so it’s been really important to get this working and working right. The tile map system as I said last update has had quite a considerate re-write because quite simply it was a little broken and needed to be fixed to work with the new artwork. I’ve ironed out the last few issues that were left with it so that it is now incredibly precise when drawing and converting from screen space to map space. I’ve also tackled some of the things I’ve been wanting to do for a while with the system so the draw order is now fixed and allows Spine artwork to be drawn behind height tiles, the combat grid and other elements can be drawn above the base tiles but below everything else, the entire map can be tinted a specific colour which is mainly used for the combat screen and the whole map is cropped to the screen so there is no drawing done off screen to improve drawing on mobile devices. Something that needed to be looked into before going head long into tackling the combat was planning the way the combat grid would work and designing it’s aesthetic. This is something else that I’ve got done and put into the game all be it in a basic manner. There’s also been a lot of core code updates happening that don’t entirely come across in the video. We’ve had a bit of a shift around and clean up of the main classes to improve things for what we were doing and for the future as the way I had tackled them was a bit strange. The intro screens can now be skipped and I’ve massively improved and changed the screen and screen management system which will help later down the line. Spine artwork and the process of creating the art has also improved to allow me to make it quicker as well as supporting future clothing/skin changes. The tile map art generation and map creation has inevitably been worked on now too so we have a solid technique for creating this new style art and getting it into the game. 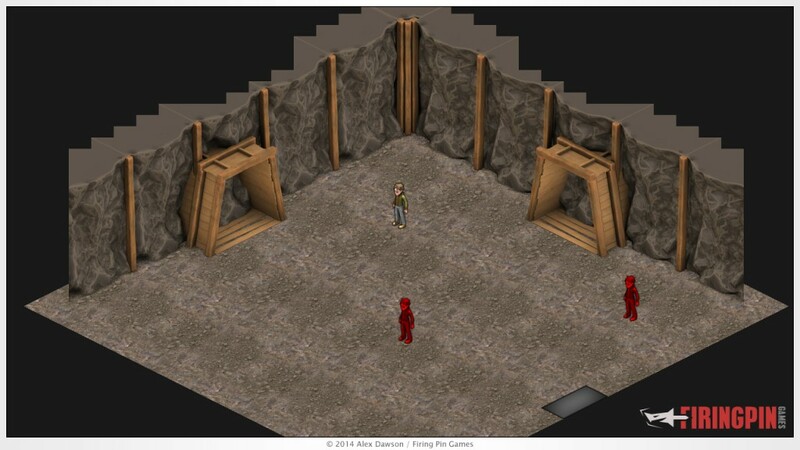 Now the path finding is tackled to a decent state Dan is going to be looking at enemy A.I. Logic for patrolling and guarding, line of sight for player detection as well as reacting to the player once he is seen. Hopefully this should be shown in the next development diary and once done Dan will be making way with the combat mechanic… exciting! For myself, I’m split between making sure Dan has all the art required for the combat screens as well as having a re-write of the user interface system. It’s been well over a month since the last update so we wanted to make a brief update to let you know how things are progressing. Time working on the game has been reduced a little due to freelance commitments, Christmas and various other things but we’ve been working solid whenever we can. During the December period I’ve mainly been working on re-writing big chunks of the tile map code, the main reason was to implement the new style artwork shown last update. We also discovered that due to my rather peculiar isometric code it was a pain for Dan to tackle the path finding and combat so I also wanted to tackle that in the re-write, luckily I found a really handy guide which has helped massively. That’s all done now bar a few polishing touches so I’m moving back onto working up a small area of the map to get in game. Dan has been hard at work writing the path finding and improved collision code which will be getting finalised this week all being well, he’s also started work on the new combat mechanic so fingers crossed in the coming month we can get some video footage of that up along with the new environment in game and the other tweaks we have been making. It’s been a while since the last update, everything is progressing nicely but a lot of what has been done this past month hasn’t been visual enough to show to you, until now. Over the last couple of weeks I’ve been working on a proof of concept for the way the environment is now going to look and work. You can see this below. It’s not an 100% perfect representation as there will be cars, objects, lamp posts and more road markings in the final game but it should give you a good idea of the direction we are heading. The previous set of environment art was created using tiled blocks, this technique worked well but came with a few problems and it was these problems that caused me to re-think the strategy behind how it would work and ultimately look. The new technique we’ll be using for mapping the environment will use tiled squares for the floor elements as before but for the building elements rather than using tiled blocks we’ll now be using longer cut up strips, I’ve made an example of this below. The new method of mapping means that the environment art can now look more detailed and can allow me to do more interesting things with buildings such as destroying them. Previously doing this with small tiled elements would have been a chore. This new method will also speed up the creation of the artwork as well as shortening the amount of time it takes to create the final in game map files. Another benefit is that there will now be less overdraw as buildings aren’t getting drawn as lots of individual tiles layered over each other; This will greatly benefit the Android and iOS versions of the game which were previously running a tad slow. The one down side is that I’ve decided to cap the height of the buildings, this doesn’t mean that we can’t increase the height later down the line however and to be honest it looks pretty good regardless. Hopefully you all agree that this looks much better than before. In other news which you may have already noticed on other gaming sites or seen me mentioning on Steam, Twitter or Facebook is that we have now been successfully green lit by the lovely folks on Steam. This is absolutely fantastic news and means we are eligible for things such as Steam Early Access which we are very much contemplating doing. A massive massive thank you to all of you for supporting, following and of course voting. We couldn’t have done this without you all and I am incredibly honoured and grateful for your continued support! Thanks! For those of you who like stats here a few for you. All being well in the next couple of weeks I’ll be doing another video diary regarding some of the new features, watch this space. That’s all for this update.